Crato is a very ancient city located northeast of Lisbon in the region of Alentejo, central Portugal. Although it has was founded in 1340, there are ruins that date back to Megalithic times. The existence of many dolmens, one being Anta's Tapadao which is now a national monument, means there were also inhabitants in this area during the Neolithic Age. Whereas during the Roman era, the Seda and Granja Roman Villa are two fine examples of this period that still exist today. During the Middle Ages, it became the headquarters for the Knights Hospitaller (later referred to as the Order of Malta) which were one of the most famous of the western Christian military orders during that period. The Order owned much of the land in this area, and one of their greatest architectural legacies was the impressive Santa Maria de Flor da Rosa Monastery. The Order’s main aim during peacetime was to devote themselves to the works of charity, religion, and in particular, hospital care. However, during wartime it was more about rescue and relief for those in the Portuguese Navy or Army who were sick or wounded. A typical house in this region would be painted white with a deep yellow trim and you will see many examples of this in Crato. The town also has many beautiful palaces, all of which are fine examples of the Baroque period. The Grao-Prior Palace is particularly famous for the Grao-Prior balcony. Because Crato was such a refined town, it was often the setting for many royal weddings throughout the centuries. If you visit the Municipal Museum there is a wonderful collection of European tiles and ceramics. Well known for its pottery, they still produce their wares using traditional methods. Visitors can watch the potters at work, and buy directly from the craftsmen themselves. There are also many activities to take part in while you are there, such as carriage tours, horseback riding, hunting, fishing and golf. If you wish to explore the surrounding area, only 13km away is Alter do Chao, a small Roman town located in the heart of Alto Alentejo. Founded in 204AD, its beautiful town houses reflect how prosperous it was during the textile years of the 16th century. Only 4km northwest of Alter do Chao is the Alter Stud Farm that King Joao V founded in 1748. The king imported mares from Andalusia to produce Lusitanian horses for the Royal Riding School. These stunning horses are now highly sought after all over the world. 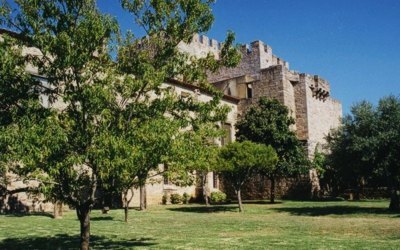 A bit further away, northeast of Crato is the beautiful town of Castelo de Vide. Much loved by the Romans, its heritage is well preserved within the walls that surround it. It is a labyrinth of narrow streets and white houses, with a Jewish quarter and synagogue dating back to the 13th century. In Crato itself is the Pousada Do Crato (Hotel Flor Da Rosa), a rather special experience if you are searching for accommodation with a difference. Built by the Knights of Hospitaller during the 14th century, this stunning building was carefully restored by the famous architect, Joao Luis Carrilho da Graca, and the gardens are just as they were back then, with the original design of the Cross of Malta. It is the perfect setting while visiting such an historical region.